Thus, authority now comes from more places, namely blawgs and blogs, and is less structured because there’s no publisher/editorial review of the blogs. The sciences have adopted digital publishing faster than the law; perhaps because of law’s reliance on precedence and an outmoded self-perception that books or print is more scholarly for lawyers than online. In addition, science often thinks that the “answer” is found through experimentation rather than researching in existing content. With all of today’s rapid changes, what’s the business model and criteria used to acquire, develop, market, refresh, and maintain content? What are the new skill sets needed by researchers, librarians, and publishers? Shaffer challenged publishers to innovate and take risks like Apple, while being highly customer service oriented like Zappos – empowering the customer service person to make decisions. She also noted a recent Outsell study that found content producers with libraries had a higher ROI than those without. Q: Why are fewer readers going to law reviews to identify trends? A: Because of the “scholarly” language used by law reviews. Readers expect shorter sentences, shorter articles, shorter words; look at the vocabulary and the text of the New York Times magazine and the New Yorker, which use simpler language now than they did previously. Law reviews are too theoretical and do not include enough fact matching or practical value. Scientists now use conversations and electronic journals instead of traditional print. That scientific communication may be a marker of how legal scholarly communication may evolve. Further external drivers may come from scholars from other disciplines training in law – their communication style will change the legal communication style. Q: There’s a lag time for legal publishers in bringing e-books to market because of difficulties with negotiating contracts with Apple and Amazon for e-books. How is the Library of Congress preparing for e-books? A: The Library of Congress is concerned about e-books. LC adds about 12 percent of the exemplars submitted for copyright to the collection. LC uses the rest in their exchange programs with other national libraries. If the exemplar is electronic, what can LC do with it? Shaffer noted concerns for authenticity and preservation of e-content as primary right now. Q: What could stop society’s current trend of self-selecting information (resulting in silos) and return to more shared common-knowledge? A: This trend may not be a bad thing. More important than knowing the same stuff is to have the ability to develop a basis to build a collaborative team. “Common knowledge” may be an anachronism; the “Three Rs” of education inadequately define what people need to know. A collaboration model where disparate individuals and groups learn from each other tends to produce better solutions. Large publishers are silos; their legal, science, and business divisions have different business models and different content collections and delivery. There is an opportunity for collaboration if the publishers break down these silos. As an example of collaboration, the LC used GIS to link addresses of new patents to show where innovation is happening in the United States. This information can have an impact of government spending to encourage and enhance areas of innovation. Q: Are different sources for legal information (blogs and podcasts) increasing in importance? Why? A: There are fewer barriers of entrance for these sources. But, what kind of authority are they? By consensus? How do librarians respond? By managing them, maintaining them, and creating access to them? Q: If libraries began storing and organizing blogs and other new web-based sources, could they become authority? A: Yes, if we take the science model as an example, but scientists tend to believe the answer doesn’t already exist and must be found through experiment. One vendor participant noted that bloggers may become the new treatise authors, which leads to a host of additional questions. What kind of publication is it? If it’s co-mingled, where does the copyright ownership lie? Roberta Shaffer, law librarian of Congress, began her keynote remarks by stating assumptions to create some “common knowledge.” Law librarians and publishers share responsibilities for preserving and organizing the “Rule of Law.” We should recognize that the language of law has changed – from Latin, Law French – and will continue to change. Will future generations understand how we communicated the rule of law in the early 21st century? We have shared fears about the future and the viability of our organizations. We know that the written word is powerful; but new technology appears to supplant pure text with combinations of text, video, and audio. Law exists across disciplines and across the past, present, and future. That means we act aware of science and sociology, as well as the historical sources of law, the current sources of law, and how law will be produced and consumed in the future. Our capacity for memory and comprehension will change. It changes because we’re using our minds differently and because bionics and drugs will enhance our abilities. Shaffer next reviewed trends facing us all. The volume of information overload now exceeds the equivalent of receiving 174 newspapers worth of information daily and sending six newspapers worth of information daily. End users have reduced attention spans and expect visualizations of information results. Our vocabulary has changed – we use shorter sentences and shorter words to help us cope with information overload. Our vocabulary may shrink so that we can communicate across cultures; perhaps even like air traffic controllers who limit all their instructions to 600 words. These have disrupted the traditional information flow to new formats, including of course social media. Our society has less “common knowledge”; more facts are known, but fewer people know the same fact. In addition we have a desire to know more – “let me see how you make that sausage” – about almost everything. Shifting cultural geographic centers to Brazil and China with different relative values of individuals v. community where other cultures have a lower value of the individual rights. Shaffer described the trends that started with the traditional law library of many books with attorneys believing that “the law” exists somewhere in the books. But now there are more first impression cases based on unique facts, which encourages looking for a legal point that matches a set of facts, i.e. finding and following the facts. This leads to reading fewer law reviews because law reviews have such a long publication lead time and deal with more theory than practical issues. Legal researchers want direct access to more information with minimal assistance of librarians – at lower costs. Law firm clients expect lower costs as well. Shaffer faults legal education for teaching in silos with edited casebooks providing the key elements so that the student doesn’t need to learn how to analyze across subject matter disciplines. Further Q & A: on The “Why, Who, What, How, Where and When?” of the Colloquium. The Vendor Colloquium Planning Committee, Joyce Manna Janto; Kate Hagan; Michael Bernier; Anne Ellis; Ann Fessenden; Richard Leiter; Linda Lev-Dunton; Robert Myers; Richard J. Spinelli; Cindy Spohr; and Committee Chair Steve Anderson, held one face-to-face meeting during the 2010 AALL Annual Meeting in Denver. It completed the rest of its work by conference calls and email. To share the committee’s work process I’ve organized the minutes of the four meetings topically below. To discuss what information creation and dissemination (“publishing”) means today with the rise of blogs, etc. Invited attendees should be “high level” representatives of the vendor and law library communities, potentially including individuals from library oversight boards (e.g., managing partners of law firms, judges, etc.). Members strongly favored diverse representation of law librarians to include younger, active librarians and librarians from a variety of job positions. Members also endorsed the concept of inviting leaders of law library governance boards, such as deans, managing law firm partners, and judges. The committee asked the chairs of each “library-type SIS” to identify and suggest to the AALL president a suitable pool of potential attendees. The president selected the final attendees, based on the available slots. The Colloquium will be approximately two days long, consisting of prepared, shared questions, and facilitated dialogue on topics to be mutually developed by the committee. How did the structure develop? The committee reviewed previous AALL colloquia, researched and solicited topics for discussion, created a “briefing book” for attendees. A small subcommittee chose background reading materials for the committee’s use. This provided the basis for the final briefing book for attendees. Based in part on this reading material, committee members sought suggested discussion topics from their constituency groups and organizations. The entire committee reviewed the subcommittee’s selections and agreed the collection should include the most relevant articles. The committee requested a two-page summary of its organization from each vendor. The chair organized the responses and the committee reviewed the compilation and suggested some changes for the two documents that became “librarians” and “vendors” responses. How to structure the colloquium? How to communicate to members? Because the AALL Spectrum publication schedule does not permit publication soon enough, the committee asked Spectrum Editorial Director Mark Estes to attend as a reporter, not a participant, to blog about the days activities. Where will the Colloquium be held? Chicago, because it’s centrally located for all potential attendees. When will the Colloquium be held? February, attendees arriving the evening of Sunday, February 27th, so that the Colloquium would begin at 9 a.m. on the 28th. The Colloquium will conclude at approximately 3 p.m. on March 1st, allowing attendees to return home that evening. The vendor colloquium, “Creating, Disseminating, Using, and Preserving Legal Information in Challenging Times,” February 28 –March 1 at the Hyatt Lodge in Oak Brook, Illinois is the 6th library and information vendor gathering sponsored by AALL. In each of these invitation only colloquia the organizers sought to bring together decision-makers and influencers in order to address common concerns related to the changing environment of legal information publishing. To control costs and encourage focused discussion attendance has been limited to about 40 law librarians and publishers. This year adds stakeholders to the group while staying at around 40 participants. In April 1994, 18 law librarians, 13 legal publishers and 2 law professors in the field of legal information technology attended the AALL Electronic Information Retreat. Attendees considered “the implications of today’s increasingly digitized information environment, in which the traditional roles of each group are changing and the differences are becoming less distinct.” Read the AALL President Kay Todd’s report here . At the 1998 colloquium 15 law librarians and 13 legal publisher representatives focused on “the effect disintermediation has on the quality of the end users’ work product when using electronic legal information” without the assistance of a law librarian. Read Kay Todd & Mark Estes’ report here. In 2001, during the fifth colloquium, “Changing Nature of Legal Research: Adapting To New User Realities” 22 law librarians and 15 legal publisher representatives explored the changing preferences research practices of students and practicing lawyers. Read Mark Estes’ report here. A friend wrote on her Facebook page, ” I don’t know what I’m hated for most, being gay, being Jewish or being a state worker.” If I were to take the news media and blogosphere seriously, it appears to be all of the above in Madison, which people are beginning to call Ground Zero for union workers. Even our governor, in a now infamous prank call, was recorded as saying his union busting bill is Ground Zero for the Republican mission to finish off all these despised union thugs. The Cheeseheads of Madison, every last one of us, have all become bit players in an Edward G. Robinson film or is that James Cagney? I’ve heard that the protests are actually the result of violent left-leaning Vietnam War protesters who live in Madison and dominate its politics. Madison is famously liberal. I think those who make this claim have a point. Vietnam War Vets and Vietnam War protesters are part of the crowd. However, if we were to call those war protesters by another name here in Madison, that name is, “Grandpa.” By my estimate, the majority of protesters are far too young to remember the Vietnam War and one Vietnam Vet I know just happens to be a 3rd grade teacher. For the sake of all public employees and private employees who risked life and limb at Ground Zero, I would like to bank down the hyperbole surrounding this event in history. Let’s all agree that there is nothing else that compares to what happened in New York City on September 11th, 2001. Or if you must make a comparison between the Madison protests and Ground Zero , let’s go with this: police officers, rescue workers and fire fighters, public union members all, are showing once again how much we need them, and every time the fire fighters march at the square, I feel an emotion I don’t often feel: Pride in my state. Normally, I take my state and its occupants totally for granted. Things I’ve enjoyed about the protest. I love the funny signs and the humor that surround the protests. One afternoon on the square, a small union group marched passed me in their union t-shirts, and man called out, “I’m with you, my brothers.” A woman in the group shouted back, “And sisters!” He looked rueful, but another marcher said it was hard to tell the women in his union apart from the men. The signs are fun, “Walker is a weasel not a Badger,” declares one UW student’s sign. “Not Koch, Pepsi,” says another, mocking the Koch Brothers connection to this mess. “100 percent of teachers have more education than our governor,” Gov. Walker left Marquette University without a degree, so the teachers have a point. Another sign by a young man read, “My parents can’t afford to send me to college, but they say don’t worry, I can still be governor.” I love the wit. Librarians are part of the protest, as are the SLIS students. Most librarians don’t even belong to a union, and yet we are coming to the Capitol with our signs, and inside the Capitol is a lending table. Protest signs, flyers and pamphlets are the badges of our working class, we, the not so lazy rabble, the not so idle middle. Social media is part of this protest. Web sites have sprung up quickly, as have Face book pages, Twitter accounts, and blogs. Posting pictures about this event and videos is all part of the process. Misinformation and hysterical opinion pieces seed the Internet, but there is a lot of good information and debate going on as well. The Law School hosted a “Forum on the Budget Repair Bill,” that was so highly attended they had to create an overflow room and stream the discussion. Several professors, experts in their chosen fields, spoke about aspects of the bill and its affect on this state. Andrew Coan, a constitutional law professor, told us that the bill was sound enough constitutionally. One of my favorite professors at the Law School, Carin Clauss, labor law specialist, spoke about collective bargaining in Wisconsin and the effect this bill could have on our workers. It will not be pretty, which partly explains the financial aspects of this protest, but certainly doesn’t explain the passion. A history professor, Will Jones, spoke about the history of unions and the history of strikes in this country. Collective bargaining put an end to that turmoil by creating a fair playing field for low wage earners, but we may be returning to those days. As a side issue, there was a discussion about the amount of debt students take on at the university and the salary of professors. The faculty is affected by this bill, but faculty are not about to complain about having to pay more toward their benefits. This bill is about money and it is not about money for almost everyone. It certainly speaks to power, those who have it and those who do not, and it speaks to what is fair. Wisconsin workers, in general, would all be happy to kick in more if it balanced the budget. That’s the irony here, we love our state. The last thing we would want is to see it struggle financially. I read that the Koch Brothers, our resident billionaire troublemakers (or is that policy makers?) told the media this is an issue of freedom and they won’t back down. Such an amusing thing to admit to: After your first billion, how much more freedom do you need? Speaking of freedom, the forum discussed free speech, but there was not time to discuss a free press. The protest itself was described as historic. I think it is safe to say that the passions that are being expressed are global, and that as the concerns of ordinary workers everywhere are being expressed in the streets, the leaders in our midst must react and overreact and, in general, prove that governing is harder than it looks. Yet maybe, just maybe, leadership isn’t about who is on your side. Perhaps leadership works best when it can bring both sides to reasonable agreement. In the Midwest bringing people together is not easy to do. We are a pigheaded lot and Governor Walker’s pigheadedness is on national display, so I don’t envy him or his family, although right now he appears to be proud of his behavior. He’s compared himself to his personal hero, Reagan, when Reagan fired the air traffic controllers. As if Reagan’s firing so many talented workers was an act of mythical heroics rather than just another fine example of how bad things can go when good citizens do not sit down at the bargaining table. Societal stress is showing up all around Madison. Doctors gave out sick notes to some of the protesters, and immediately the media questioned if this was a violation of their medical ethics. Teachers in Madison called in sick by the hundreds and it closed the schools here, their ethics and even their dedication to children was questioned. Firefighters, exempt from the repeal of collective bargaining for state workers, show up every day to march in solidarity with their fellow union members, some play bagpipes. 14 Senators fled the state and almost all of Wisconsin’s senators are being recalled. By this time next year the governor will be under recall. You can count on it. So, what exactly is going on to cause all this chaos? They say it is a budget crisis, but we’ve had unbalanced budgets before in this state without going absolutely wacky. I doubt this is only about money. On Monday, a general library meeting is being held to discuss how we will handle a strike, a looming possibility in this turmoil. Many library employees are members of a union. We who are not part of a union are being asked if we want to be scabs or unemployed librarians. We are being asked to make a choice between our devotion to our student population and our conscience. Those are tough choices. The university itself may be partly privatized. You can just imagine the passionate debate about this decision that is being promoted by our administrative leadership. Toss in the fact that the governor has not yet released his state budget. In anticipation of the budget gap, pink slips have already been issued, just to add to the air of calm. This will, of course, not end well. Our governor will never remove the stain on his character. Yes, there are those who passionately believe he is a Tea-party darling and have romanticized out of all proportion a man with an evident bald patch. I’m a librarian, middle aged, glasses, with a bit of a tummy pouch since I had kids, so I’m not throwing stones at his looks. I’m just saying Governor Walker is not the stuff to pin your dreams on and his leadership skills, now tested, have proven to be lacking. Pigheadedness is not leadership. In turn, the unions are toast after this bill becomes law and they know it. The Democratic party is about to become the permanent minority party in this state, and I’m not really sure who is holding the purse strings, so I’m more than a little nervous about all this change. I think we all are, even the intellectuals among us who cheer these events as a “creedo,” moment in our history. We are divided. Divided in our loyalties, divided against our neighbors: Lazy lefty thug union workers! Tea-party wing-nut crazies! We are unsure of our future and confused about what is the right thing to do to help our state recover from a recession that was not of our making, but brought down upon us by forces beyond our control. My guess is that if we all sat down and used our heads, we could work this out and come out of it a better state, but that’s not going to happen. Where do I stand in all this? I stand with the teachers, the police officers, the firefighters, and all the state and union employees. I stand with the students and faculty who need my specialized skills as they continue to produce a quality education for everyone. I stand with our business community, because I am a talented business law librarian and I never feel more useful than when I help a business find the resources it needs to thrive, and in the end, I stand with my government, my legislative officials, and the executive branch of Wisconsin. Not that any of that matters in the slightest, darn it all. 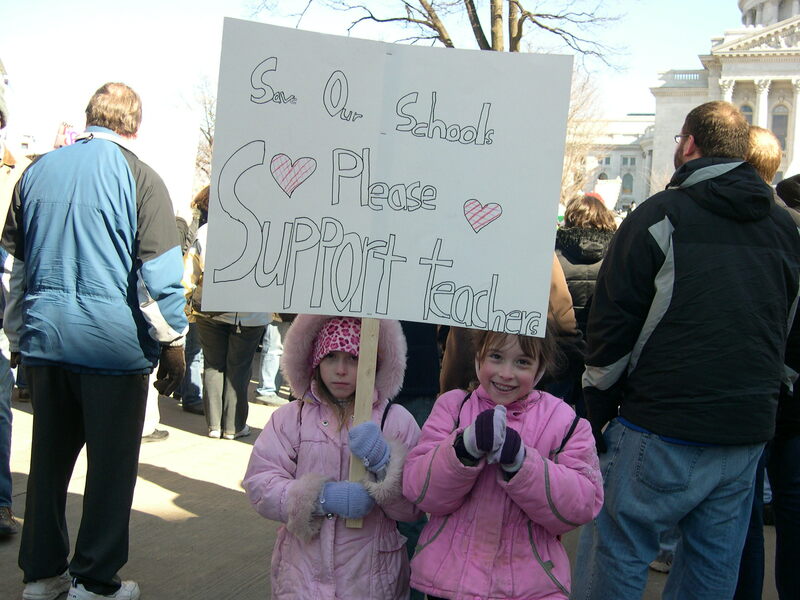 Finally, I stand in the Capitol, eating free pizza donated from across the globe, carrying a sign my daughters’ made. “Save our Schools. Please Support Teachers.” SOS…SOS…SOS. Q: What was the impetus for the Vendor Colloquium? A: AALL has held a number of Vendor Colloquiums. The first was held in 1994. The most recent was held in 2001. With the creation of the AALL Vendor Liaison position and the rapid changes in legal publishing, the Executive Board felt the timing was right to hold another meeting between law librarians and legal publishers. The planning committee for this event was appointed in late spring by then AALL President-Elect Joyce Manna Janto. The committee held its first meeting in July 2010 at the AALL Annual Meeting. Q: How much does it cost, and who’s paying? A: The budget amount of $27,500 was included in the AALL annual budget for 2010-2011, which was approved by the Executive Board in July 2010. The publisher participants are paying their own expenses, while the other invited participants, namely stakeholders and librarians, are covered by the budget. Q: How were the invitees selected? A: The three AALL special interest sections that represent members by library type (ALL-SIS, PLL-SIS, and SCCLL-SIS) were asked to submit the names of members they felt should be invited. The committee reviewed those names and selected from that list. In addition, the committee identified other stakeholders and members who they felt should be invited to attend. For the stakeholders, the committee asked the Association of Legal Administrators (ALA) and the Legal Marketing Association (LMA) to recommend to members from their leadership to attend. For the other stakeholders, the committee brainstormed to find candidates. The other stakeholders include a judge, a reporter of decisions, and the executive director of the Center for Computer-Assisted Legal Instruction (CALI). Q: How are individual law librarians concerns being heard? If you had an opportunity to ask legal information vendors five questions about their institutions and legal publishing trends, what would they be? What five things would you like to tell legal information vendors about your library and its users? The responses were organized and synthesized and shared with the participants. Click here for the librarian questions. Q: How are the vendor concerns being heard? If you had an opportunity to ask librarians five questions about library and information trends, what would they be? What five things would you like to tell librarians about your company and the legal information industry? Q: was there any background reading for the participants? A: Yes. Click here for the bibliography with links to the reading material. Q: How can I comment/contribute now? A: You can contribute by commenting to this blog or by emailing me (mark.estes@acgov.org). I will try to address questions/comments and, if appropriate, share them with the colloquium participants. Martin J. Sweet. Merely Judgment: Ignoring, Evading, and Trumping the Supreme Court. Charlottesville, Virginia, University of Virginia Press, 2010 (224 pages); $35.00 hardcover. Merely Judgment: Ignoring, Evading, and Trumping the Supreme Court by Martin J. Sweet is recommended for anyone interested in the United States Supreme Court and the influence of legal, social, and political factors on compliance with Supreme Court rulings. Sweet guides the reader through several examples to support his theory that legislation involving constitutional rights tends to be written to avoid litigation rather than comply with Supreme Court decisions. Merely Judgment: Ignoring, Evading, and Trumping the Supreme Court raises questions and sheds light on Supreme Court decisions and their impact on law and society. Sweet begins with an introduction to City of Richmond v. J.A. Croson Co., 488 U.S. 469 (1989), which, he explains, generated affirmative action program growth throughout the 1990s. In Croson, the Supreme Court set forth how legislation can survive the strict scrutiny standard. According to Sweet, the effects, however, continued to demonstrate an inability of challenged affirmative action programs to survive. He explains that lower courts strike them down when challenged. But most suspect programs are never challenged, and new legislation is written to avoid litigation. In Chapter two, Sweet describes how social barriers to litigation such as lack of knowledge of legal rights can keep unconstitutional legislation from being challenged. He explains that the legal saga of Philadelphia’s minority business enterprise program provides an example of the judiciary appropriately having the final say regarding constitutional issues between the courts and the legislature. Chapters three and four provide examples of political and legal barriers to challenges of suspect legislation. Sweet asserts in Chapter three that the city of Portland, Oregon maintains an unconstitutional minority business enterprise program by blocking litigation. He explains that Portland officials believed their program could not withstand the strict scrutiny required by Croson. Therefore, he states, the city created political barriers to challenge by providing assistance to the interest group most likely to challenge the program. Sweet contends this conduct threatens the judicial role in constitutional interpretation. In Miami, however, Sweet explains that little to no implementation of the minority business enterprise program means no one has standing to challenge the program, which allows an unconstitutional program to remain in place, slyly undermining the authority of the Supreme Court. Sweet explains this legal barrier to litigation has allowed Miami’s minority business enterprise program to remain largely unchanged since before Croson. In Chapter five, Sweet explores barriers to litigation challenging constitutionally suspect legislation beyond affirmative action. He explains that hate speech laws are not challenged due to social, legal, and political barriers. Further, he explores social costs inhibiting school prayer challenges, legal barriers to flag burning law challenges, and political barriers to legislative veto challenges. Though his assertions are somewhat inflammatory and potentially offensive to legislators, he provides well-researched arguments, utilizing empirical evidence to support his claims. Sweet concludes with an explanation of how even when a potential challenge of suspect legislation overcomes social barriers, legal and political barriers still may assist unconstitutional laws to remain in place. Sweet asserts that the political barriers are most troubling because they represent calculated conduct by elected officials to undermine authority of the Supreme Court. He calls for judicial primacy yet sets forth few practical approaches for implementation. Reviewed by Michele Thomas, Catalog & Reference Librarian at the University of Arkansas at Little Rock William H. Bowen School of Law Library.